Oxygen is so commonly taken advantage of, but if you have COPD or another lung disease then you are thankful for every breath. As a patient you know, oxygen is a vital requirement for you to overcome the breathlessness attributed to your lung disease. The benefits from supplemental oxygen are countless, but neglect for your oxygen delivery method can be both costly and dangerous. Oxygen Tanks - This has been the standard oxygen delivery for quite some time now. The compressed oxygen will come in a steel or aluminum tank, with a few options for size so patients can use them at home or while on the go. These have to be refilled regularly requiring patients to have a couple on hand at all times, and oxygen tanks are not FAA approved. Liquid Oxygen - A higher amount of liquid oxygen can be stored in a patients home without taking up excess space, however if the liquid oxygen supply is not used quick enough it will evaporate. Stationary Oxygen Concentrators - Stationary oxygen concentrators take up a considerably less amount of space compared to oxygen tanks, these require no refills because they produce medical grade oxygen from the air in the room. 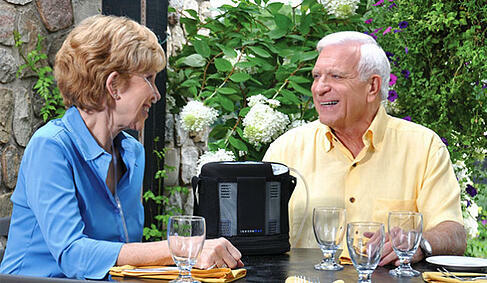 Some stationary oxygen concentrators are also able to refill oxygen tanks. Portable Oxygen Concentrators - These do the same thing as stationary concentrators in the sense that it produces medical grade oxygen from the air present in the room, but allow patients to receive their required oxygen in a more lightweight and compact machine. Portable oxygen concentrators give patients freedoms that no other oxygen delivery method can, one of this biggest is they are FAA approved for in-flight use. NEVER use oxygen while around an open flame. Which means avoid matches, lighters, candles, stoves, fireplaces, and any other open source of flame while receiving oxygen. When cooking stand a minimum of 5 feet away from the stove while using oxygen. Try to avoid baggy clothing while cooking or near an open flame as this poses a serious fire hazard. Stay clear of petroleum based lotions and products because if they are flammable they can combust in the presence of oxygen. Water based formulas are the best alternative. Always keep oxygen concentrators well ventilated. Never smoke near your oxygen concentrator, if a guest needs to smoke ask them to go outside or declare your home a smoke free environment. NEVER store items on top of your oxygen concentrator. Close the oxygen supply valve on you're tanks when they are not in use. When using supplemental oxygen it is extremely critical that you follow the previous safety tips, if these tips are avoided disaster may not be far. Talk with your doctor if you have any questions or concerns regarding your oxygen delivery method.